When NASA's space shuttles launch into orbit, they don't just carry astronauts and supplies into the final frontier. There's a lot of other weird stuff that makes the out-of-this-world journey, too. NASA's final space shuttle mission launched July 8. The mission was the 135th and last flight for the program, which began in 1981. Read on for 9 space oddities carried into orbit on NASA shuttles. 1. Cans of Coca-Cola & Pepsi In 1985, special modified cans of Coca-Cola and Pepsi soda rode aboard the space shuttle Challenger on its STS-51F mission. The trip added more fuel to the so-called "Cola Wars" between the Coca-Cola Company and Pepsi, Co.
2. The New York Mets' Home Plate In 2009, as the New York Mets organization prepared to move its baseball team into the new Citi Field in Queens, N.Y., a piece of hardware from the team's old home, Shea Stadium, made a special trip into space. On May 11, 2009, the home plate from Shea Stadium launched into orbit on the space shuttle Atlantis' STS-125 mission— the last trip to the Hubble Space Telescope. 3. Buzz Lightyear – To Infinity and Beyond! 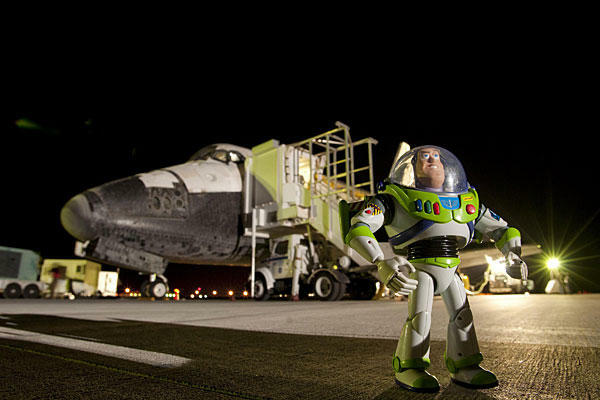 As part of an educational and public outreach mission, NASA teamed up with Disney to launch an action figure of the beloved character Buzz Lightyear, from Disney-Pixar's film "Toy Story," into space. A 12-inch-tall Buzz flew to the International Space Station on Discovery's STS-124 mission in May 2008. Fans of the iconic "'Star Wars" films celebrated a moment where fiction met reality, when a lightsaber prop from the sci-fi movies flew on the space shuttle Discovery's STS-120 mission. The lightsaber's flight was of particular interest to one STS-120 crew member, a self-described big 'Star Wars' fan who also woke during the mission to the theme from the movies. 5. Dirt from Yankee StadiumA vial of dirt from the pitcher's mound at Yankee Stadium, the home of Major League Baseball's New York Yankees, flew on the space shuttle Endeavour's STS-123 mission in 2008. Astronaut Garrett Reisman , a fervent Yankee fan, brought the small container of dirt with him, along with other mementos of his favorite team, including a banner and hat autographed by George Steinbrenner, who was the principal owner of the team for 37 years, from 1973 to his death in July 2010. What do you think the future holds for our space program. Perhaps a journey to Mars?